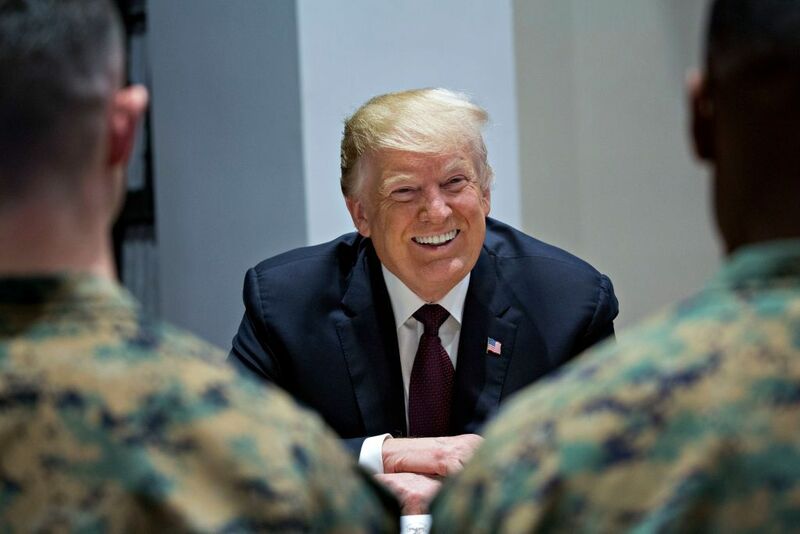 President Donald Trump has told aides and White House officials that he was afraid to visit U.S. troops in war zones, and didn't back the wars in Iraq or Afghanistan. Trump told advisers that he had considered visiting troops in overseas combat zones, after a series of decisions that critics said showed disrespect toward the military and the troops. The president canceled a visit to a cemetery where thousands of U.S. Marines were buried during a trip to Europe for ceremonies marking the 100-year anniversary of the end of World War I, and did not visit Arlington National Cemetery on Veterans Day. In an interview with Fox News Sunday, Trump dismissed retired Admiral William McRaven—who oversaw the 2011 mission that trapped and killed Osama bin Laden—as a partisan “Hillary Clinton fan," and questioned why the military hadn’t killed bin Laden sooner. In the same interview Trump told host Chris Wallace that he hadn’t visited troops in an overseas war zone because of his hectic schedule. "I’ve had an unbelievable busy schedule, and I will be doing it. On top of which you have these phony witch hunts. On top of which—I mean, we’ve just been very busy. But I will be doing that," he said. Trump also expressed his regret at not having visited Arlington National Cemetery on Veterans Day, saying had been busy with phone calls. “I should have done that. I was extremely busy on calls for the country. We did a lot of calling as you know,” Trump said. Former Defense Secretary Chuck Hagel in a recent CNN interview described Trump not visiting troops in a war zone as a "failure of an obligation. "I think it's bigger than just a misstep—I think it's a failure of an obligation, of a basic obligation of a commander in chief," Hagel said. "He's commander in chief of our forces, and not to go to a war zone where we have men and women dying, that's just wrong." According to The Post, Trump will not be visiting troops over the Thanksgiving holiday, which he will spend at his Mar-a-Lago resort in Florida.